It’s quarter final time and that means predictions aplenty pour moi. Despite all the upsets so far robbing us of some dependable names, the line-up looks mighty fine regardless. The Spaniard has proven herself as more than a one-win wonder and progressed with veritable ease here after that Serena silencer. But Maria has enjoyed more parisian bagels than anyone so far, and may well steamroll her opponent again. Verdict – Sharapova in two. Tough one this, Bouchard has been one of the form players of the tournament and is enjoying a stellar, breakthrough year (although she’s been on the radar for a while now). But in Suarez-Navarro she faces one of the purest of clay specialists who looks rightfully confident. Verdict – Suarez-Navarro in three. In a generational battle, the 2009 champion meets the highest remaining seed. But it isn’t quite as easy as that, Kuznetsova has been playing well but has never proven bulletproof in these latter years of her stellar career. Will she have enough to silence a player who – when she clicks – is unplayable? Fascinating one this. Really rather torn here as who couldn’t be a fan of the German come-back queen and real character who after a year of highs and lows so far has really clicked at RG 2014. Of course she hasn’t done it the easy way and could fall foul of the 2012 finalist. 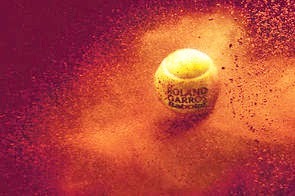 My weakness for all things Italian and admiration anyway for what Errani has achieved means I have no clear favourite. Verdict – Errani in two. The Serbinator has looked unstoppable so far here despite some tough tests early on. As good as young Raonic has been as well, he will fall here unless Novak has a major mental AWOL. Berydch has been playing very very well and is perhaps in for the best chance at a maiden major yet – all this despite the abomination of a shirt. But Gulbis has finally delivered on all of his own worded promise. The Latvian at his most unpredictable yet devastating best against an off-colour Fed-Ex. Convenient clutches of the thigh aside, Murray looks to have played himself back to his very best – or at least close to it. For all his acrobatics, Monfils – even with the home crowd – hasn’t got enough to cope with such an opponent. Last year’s final fixture will likely produce a similar result. Okay Nadal had a shaky clay season build up but has looked supreme on the big stage. Ferrer will take much solace from his recent win over the Spaniard but will surely wilt again.